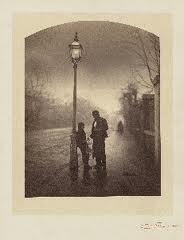 An exhibition I had the pleasure to enjoy last week: Camille Silvy: Photographer of Modern Life. Camille Silvy (1834-1910) worked both in France and Britain and is regarded as one of the pioneer photographers as he -through his work- celebrated the portrait photography in a period in which this ‘style’ was not common. This entry was posted on September 13, 2010 at 11:20 pm and is filed under Arts. You can follow any responses to this entry through the RSS 2.0 feed. You can leave a response, or trackback from your own site.